Plastic has taken over every aspect of our lives and is affecting our health, animals and the environment. Over the last 10 years, we have produced more plastic than we had in the last century. Half of the plastic we use is only used once and thrown away. Throwing plastic away means it is either buried in landfills, remade into other products or lost in the environment where it ultimately washes out to sea because it takes 500-1,000 years to degrade. When plastic “degrades” it breaks down into smaller fragments, but never goes away because plastic was made to be indestructible. And yes, this indestructible plastic is made with chemicals that we as well as animals ingest. BPA, or Bisphenol, was originally created as a human birth control chemical in the early 1900’s, but banned because of its risks of causing cancer in women. However, in the 1950’s, scientists realized that BPA can be used to harden plastic to make it that much more durable. To this day, BPA is still used in baby bottles, water bottles, food packaging, cans and receipts. 93% of adults are contaminated with BPA. There have been studies on animals that show BPA affects hormone levels, causes brain and behavior problems, cancer, heart problems and other conditions like obesity, diabetes, ADHD. There is an increased risk in children because their bodies have a decreased ability to clear BPA from their systems. In 2010, scientists revealed that the general population may suffer adverse health effects from current BPA levels. In 2012, the FDA banned the use of BPA in baby bottles, but the Environmental Working Group called the ban “”purely cosmetic” and said the FDA would have to ban BPA from all food packaging. The FDA continues to support the safety of BPA in food packaging. Apart from plastic being extremely harmful for our health, it is also harming the environment. There is currently 268,000 tons of plastic floating in the ocean covering 40% of the ocean’s surfaces killing mammals, sea birds and the ecosystem. Marine animals either ingest plastic mistaking it for food or get caught in it. 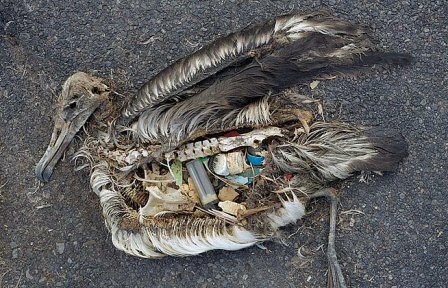 If you were to cut a dead fish or bird, you would find pieces of plastic in their stomach, which we eventually eat. If you are interested in seeing all the plastic in the ocean, check out Plastic Paradise on Netflix. Next week, I will share ways to be more zero waste starting with the workplace.